Last March I published a post  the conclusion of which was: "... the bottom line of this post is that we may, before too long, see the ECB and national macro-prudential agents in Germany and in other countries where there are more pressing financial stability concerns actively engaging in trying in earnest the macro prudential route." This prediction did not come true as yet, still I think we are moving closer to it. Indeed, macro-prudential measures are invoked more and more often to deal with the dilemma created by the need to keep interest rates close to the un-natural, zero bound (and even negative, in the case of the ECB) to fight too low inflation, while fearing its negative effects on financial stability. The dilemma can graphically be illustrated in the following chart (adapting an approach that was used to illustrate possible dilemma situations between fighting inflation and unemployment with the single interest rate tool). In quadrant I, too high inflation and the danger to financial stability, coinciding with an excessive risk seeking behaviour, consistently require an increase of interest rates by the central bank. Symmetrically, quadrant III requires a lowering of rates. Quadrant II and IV denote dilemma situations. 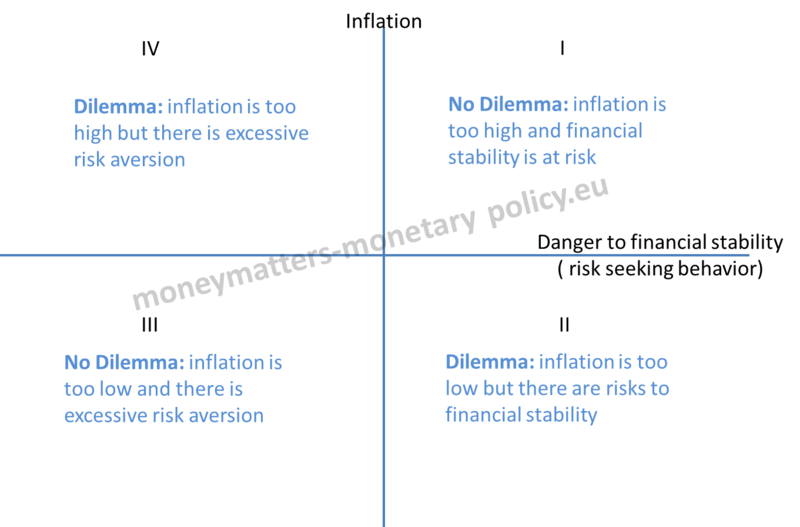 In particular in quadrant II, which is relevant for current conditions, inflation is too low (the origin denotes the optimal level of inflation) while there are risks to financial stability (the origin denotes the optimal level of risk seeking), that would require increasing rates. Indeed the evidence of too low spreads, search for yield, insouciance to risk and too low volatilities, which was mentioned by the Cassandras before the Great Recession as proof of a danger of financial instability, is worrying again central banks and other financial market participants. Of course, the doubts about the effectiveness of the little tested and uncertainly calibrated macro-prudential tools, which I mentioned in my old post, have not been eliminated, still the hope that they could help resolve the dilemma illustrated above seems to be spreading widely. I thought it useful to collect and report in this post some relevant quotations going in this direction, together with some others that doubt the ability of macro-prudential measures to really allow an escape from the dilemma. At the end of the post I will also give my bottom line on the issue. Yes, macroprudential tools can assuage the dilemma. Andrea Dombret, Member of the Executive Board of the Bundesbank: "The primary goal of monetary policy is to safeguard price stability. To reach this objective, the independence of monetary policy has to be maintained in all its dimensions, at all times and everywhere. Thus, to safeguard financial stability, a different set of tools is necessary, and these tools are usually referred to as macroprudential policy." Sabine Lautenschläger, Member of the Executive Board of the European Central Bank: "At European and national level, there are various institutions that can counter some, though not all, of the risks of asset bubbles. One such institution in Germany is the Financial Stability Commission, ... the ECB, too, through the establishment of the Single Supervisory Mechanism, has macro-prudential powers." Peter Praet, Member of the Executive Board of the European Central Bank: "... it is important to keep in mind the distinction between what monetary policy can and should do, and what is the domain of macro-prudential policy. Monetary policy has the clear primary objective to maintain price stability in the euro area over the medium-term. Macro-prudential measures should be used, if needed, to smooth the financial cycle in specific sectors or jurisdictions." Benoit Coeure, Member of the Executive Board of the European Central Bank: "As for financial asset prices, their current level is high and can only be justified by the prospect of a continuing reduction in public and private debt levels in euro area countries, and sustained reform efforts to lift productivity. A continued rise that was not matched by underlying improvements would be a matter of concern, and should be addressed using the macro-prudential instruments available. Mario Draghi, President of the ECB: "We think that our monetary policy is perfectly adequate with respect to our stance. We have a mandate, which is price stability, and the current stance of our monetary policy is geared to achieve this mandate. However, we are at the same time quite sensitive to the formation, creation, to the presence, of potential financial stability risks. And there, we've taken a number of initiatives to address these risks, ... So we are addressing these risks as we see them, but the bottom line of this is that the first line of defence against financial stability risk should be the macro-prudential exercise, macro-prudential tools. I don't think that people would agree with the raising of interest rates now for the ECB. It would be quite an interesting proposition but is one that I wouldn't share." Jon Cunliffe, Deputy Governor for Financial Stability of the Bank of England: "Monetary policy, may, as Jeremy Stein said when he was at the Federal Reserve, be effective in tempering financial stability risks because when we change interest rates it "gets in all the cracks". But because it gets in all of the cracks across all of the economy, using interest rates to deal with financial stability risks can carry a high cost. It is a very blunt instrument that affects the economy as a whole. So although it is an effective line of defence, it should be seen as one of the last lines of defence. The question then becomes how do we ensure that it does not - because we lack other instruments - have to be used as a first line of defence? Here the financial crisis and recession has led to the development of what is now called 'macro prudential policy'. In essence, macroprudential policy means using the regulatory 'stance', the underlying settings of the regulation of the financial sector, first to reduce the probability and impact of systemic crisis and then, by varying those settings, to counter emerging threats to financial stability." Janet Yellen, Chair of the Federal Reserve: "For example, Canada, Switzerland, and the United Kingdom have expressed a willingness to use monetary policy to address financial stability concerns in unusual circumstances, but they have similarly concluded that macroprudential policies should serve as the primary tool to pursue financial stability. In Canada, with inflation below target and output growth quite subdued, the Bank of Canada has kept the policy rate at or below 1 percent, but limits on mortgage lending were tightened in each of the years from 2009 through 2012, including changes in loan-to-value and debt-to-income caps, among other measures. Similarly, Sweden’s Riksbank held its policy rate 'slightly higher than we would have done otherwise' because of financial stability concerns. In both cases, macroprudential actions were also either taken or under consideration." Janet Yellen, Chair of the Federal Reserve: "In my remarks, I will argue that monetary policy faces significant limitations as a tool to promote financial stability: Its effects on financial vulnerabilities, such as excessive leverage and maturity transformation, are not well understood and are less direct than a regulatory or supervisory approach; in addition, efforts to promote financial stability through adjustments in interest rates would increase the volatility of inflation and employment. As a result, I believe a macroprudential approach to supervision and regulation needs to play the primary role. But experience with such tools remains limited, and we have much to learn to use these measures effectively." Mark Carney, Governor of the Bank of England: "The Bank will also have to act on its own by using all of its tools in as complementary a fashion as possible. The FPC is considering using macroprudential tools to insure against potential vulnerabilities associated with the housing market. Doing so could reduce the need for monetary policy to be diverted to address a sector-specific risk. However, macroprudential policy is not a substitute for monetary policy. If it is used for insurance it won't necessarily affect the path of interest rate increases. The need for internal balance - to use up wasteful spare capacity while achieving the inflation target - will likely require gradual and limited interest rate increases as the expansion progresses. The start of that journey is coming nearer." Scant hope that macro-prudential tools can cope with the dilemma: raise rates! "... macroprudential measures, while useful to strengthen banks, have on their own proved unable to effectively constrain the build-up of financial imbalances, especially where monetary conditions have remained accommodative. " "Emerging market economies and small open advanced economies struggled to deal with spillovers from monetary ease in the major advanced economies. They have also kept their policy rates very low, which has contributed to the build-up of financial vulnerabilities. This dynamic suggests that monetary policy should play a greater role as a complement to macroprudential measures when dealing with financial imbalances. " "The overall strategy for national policy frameworks should be to ensure that buffers are built up during a financial boom so that they can be drawn down in the bust. For prudential policy, this means strengthening the framework’s systemic or macroprudential orientation. Available instruments, such as capital requirements or loan-to-value ratios, need to be adjusted to reduce procyclicality. For monetary policy, this means being ready to tighten whenever financial imbalances show signs of building up, even if inflation appears to be under control in the near term. And for fiscal policy, it means extra caution when assessing fiscal strength during financial booms, and taking remedial action. " In the BIS Report, one also finds practical examples of macro-prudential measures taken in India, Indonesia and Turkey. The statements above come from very distinguished sources but, unfortunately, they are not consistent one with the other. So the reader may be interested in a clear, overall conclusion. Let me try and satisfy this request by presenting three elements that form an apparent contradiction, which I will then try to solve. First, I am quite sceptical about macro prudential tools, at least about our current ability to use them effectively because the relative policy is just in its infancy. Second, I think that indeed there are currently financial stability risks that need to be attended. Third, I believe the main responsibility of monetary policy is to maintain price stability. The way to solve the apparent contradiction between the three elements is based on two considerations. First, if the horizon over which price stability is preserved is long enough, the situations where price and financial stability requirements really create a dilemma become rarer: episodes of financial stability inevitably bring about, at the end, episodes of price instability, as proved by the Great Recession. If these long term consequences are factored into a monetary policy devoted to price stability, the potential dilemma between financial and price stability gets less acute. Second, an appropriate sequencing can also deal with the dilemma: in conditions like those of quadrant II in the chart above, where pice stability requires low rates while financial stability would demand higher rates, all possible efforts should be made to deal with financial stability by means of macro-prudential measures. Only when these would prove ineffective should one resort to higher interest rates. This view is similar to the "first line of defence" argument presented by Draghi, Cunliffe, Carney and Yellen, even if the part on the need to eventually raise rates because of financial stability reasons is not really explicit in their utterances.